These would be perfect for any get-together! I love when things are mini. For some reason, it just seems very elegant! These are so cute and elegant! I'll definitely be making these. So cute! 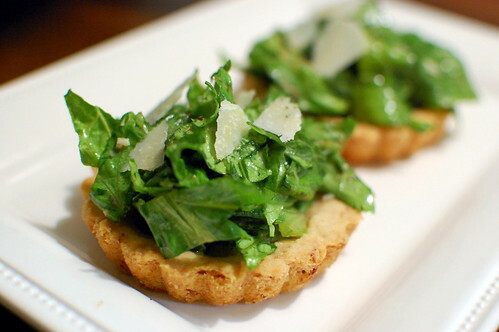 I love caesar salad, so these look really fun! What a unique treat--fantastic idea! Yum, this has made one of my favorite foods bite-sized! I can't wait to give these a try. I bet those garlic crusts are so buttery and delicious! these look beautiful!! can you make the tarts ahead of time and freeze? would to make these for a wedding shower.